Transcend Records are pleased to announce the signing of one of Britain's most promising young Metal acts – Rise To Remain. Despite only forming in 2008 the band have made a massive impact on the UK festival and live circuit kicking off with an appearance at Download festival in the same year swiftly followed by a vicious set on the Bloodstock main stage. On the strength of these performances the band were offered opening slots on both the Trivium and Haunted tours as well as the Five Finger Death Punch tour in Feb 09. 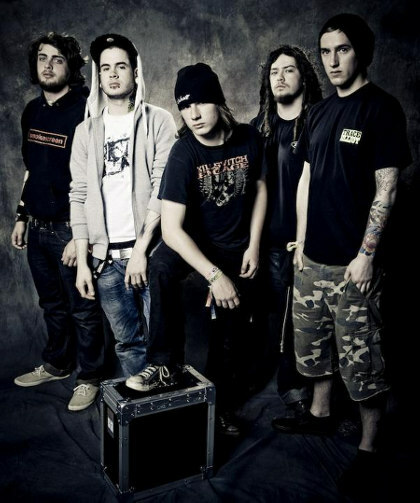 The guys have also shared stages with the likes of Soulfly, Exit Ten, Anterioir and Sylosis alongside a string of their own headline dates throughout the UK. Rise to Remain really came of age at the inaugural Sonisphere festival where they managed raise their own barlaying waste to the Bohemia stage with a double ‘wall of death’ performance! The bands front man Austin Dickinson said "As a new band, we want to do things our own way, not follow the crowd and to be our own entity instead of trading quality for quantity, so to speak. For the sake of our longevity, its crucial that we get the right people, our own people, behind us. Transcend Records, boasting a stellar roster already, absolutely came through for us and are the ideal label for where we are currently at. We're incredibly happy that Rob and the rest of the Transcend team are working with us, and we absolutely can't wait to unleash hell with them!" With their highly anticipated debut mini-album already in production for Transcend Records, Rise To Remain are perfectly positioned at the forefront of the UK breaking Metal scene, look out for them as they come tearing through a town near you on their relentless touring schedule supporting the release!